India celebrates the Kite Festival on January 14th every year. The festival celebrates the sun and the sky and respecting how the world moves and the sun gives us light without expectations. The kite symbolizes continuity of it being “cut” down then ascends back up to the skies. The festival symbolizes unity of the country. Kite Festival brings friends and family together on many rooftops. Children fly kites all throughout the month of January but all people fly them on the 14th and the 15th. People cheer as they “cut” other neighboring kites down through lots of skills and technique. I went to Virenbhai’s rooftop and enjoyed homemade chili, guava seasoned with masala spices, and chikki which is peanut brittle. Viralbhai and Vaishaliben wanted to help provide the children at Kiran Center to have a fun Kite Festival. Each child was given 5 kites to fly along with a guava and chikki as we sent them home for the weekend. Moving Together from Lester, England and college students from DMU did a dance workshop with the 4th and 5th standards. The choreography was such high intensity and the children were mesmerized by their passion for dance. It was fun to see the children dance to English music as well as to Indian pop. The boys get into dancing just as much as the girls. Dancing is a cross cultural and multi-language connection without having to say very much. 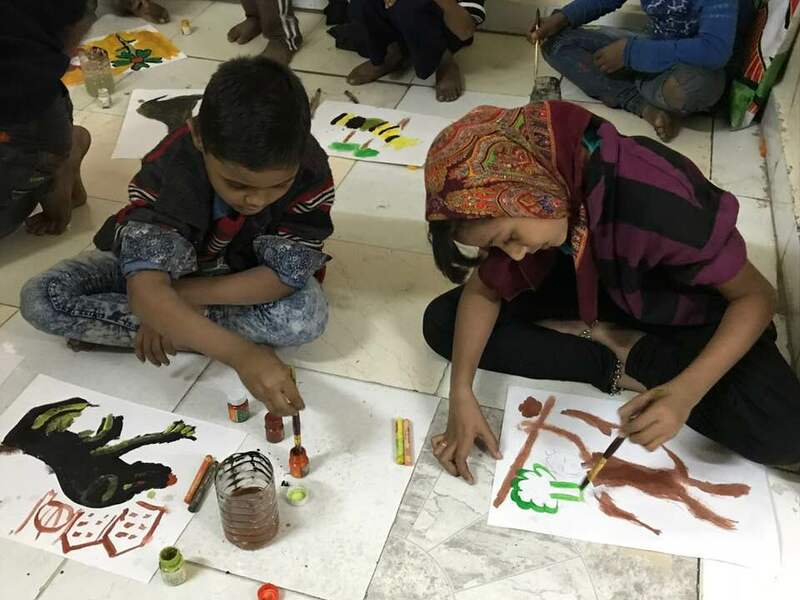 5th standard had another great opportunity to experience with painting for the first time thanks to Deborah and Gerald Huth from Santa Rosa, California. Gerald Huth is a successful artist who provided this experience. They painted their favorite animal or flower utilizing bright colors, being meticulous with the materials, and the details. I have been waiting patiently to start the English curriculum. I met with the education coordinators and got their approval to test pilot the Reading A-Z online reading and phonics program at Manav Gulzar and at Tekro Center (Community Center) for 2nd and 4th standards. I am testing this for the next few weeks. I’m teaching along with Falguniben and Kusumben at Manav Gulzar to see if the program is simple to implement. Then we will start training the teachers for the next three months on how to teach this curriculum. My goal is to print all the materials (lesson plans, basal level reader books, picture phonic cards) for all five centers. So far, the reactions have been positive in that the kids are enjoying being engaged in the lessons. The students are learning nursery rhymes to as a fun way to hear words that have similar sounds. They are showing understanding of rhyming words; I’m teaching family word patterns for them to understand how sounds work in English and modeling fluency during the read aloud time of the lesson.